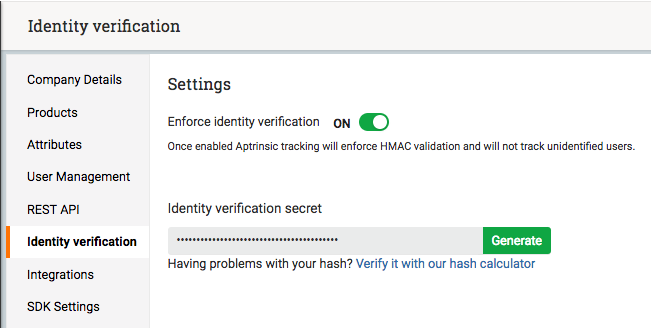 Enabling identity verification means Gainsight PX will use HMAC id so we can have a secured way to validate that a logged in user doesn't try to impersonate as another user - this feature should be set via account product settings. The purpose of identity verification is to verify that your users are who they claim to be. It works by using a server side generated HMAC (hash based message authentication code), using SHA256, on either your user’s email or user_id. Once identity verification is enabled, We will not accept any requests for a logged-in user without a valid HMAC. One your server side has implemented identity verification using the hash key you can enable it under account settings.